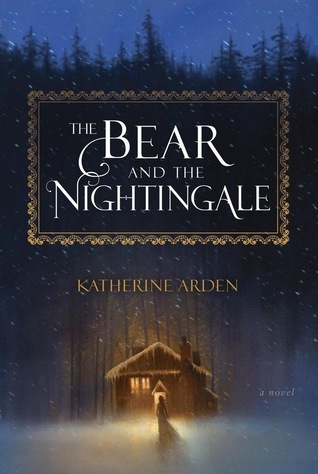 I am usually a pretty big fan of fairy tale retellings, especially when it is one like this was blurbed to be, a not so well known Russian tale. I was lucky enough to win an advanced copy through a Goodreads giveaway. However, when I first began this, I was afraid I wasn't going to finish it. It took me a bit to get into it. In the end though, I'm glad I stuck it out, as it turned out to get really good, and so hard to put down! The story is about the winter demon basically. At the beginning, the mother of the family goes off to the woods, and swears that she will have a baby like her own mother was. Her mother was part royalty, but also had some kind of unusual ancestry. And when she has this child, she dies in childbirth, and the new child is odd. This new little girl is named Vasilisa. Vasilisa doesn't behave like a normal girl would, she enjoys playing outside and stays outside. She also acts like she sees the little creatures that are part of the Russian folklore. Well, she really does see them, even some of the dangerous ones that she is able to help save some of the townfolk from. When her father travels into Moscow, he ends up with a wife, and soon after that, a new priest. A priest who wants to force the backwards village people to give up all of their old ways and "false idols" to worship only the one true god. But in doing so, the villagers lose their protection against the winter demon and soon bad things start to happen. The winter gets really bad. Very large wolves begin attacking. And the people begin to turn on Vasilisa, believing she must be a witch because she doesn't give up the old ways. All kinds of things are tried, her stepmother even tries to send her away when her father is not there, wanting to get rid of her, and the attention that the priest seems to be giving to Vasilisa instead of the stepmother. The stepmother has always seen the creatures, and thinks they are demons and that she is going crazy when she sees them. There is so much more to this story. Vasilisa will have to go back into what her mother did to bring her into this world, and she will discover her own connection to the winter demon, and why she can see all these creatures. She will also have to figure out if there is a way she can help her people, basically save them, when it seems the person they have now turned to for their salvation, is the one that has brought the devil into their midst. Like I said, it took me a while to get into, about a fourth of the way before I was to the point of having trouble putting it down. But halfway through I was at the point that I could barely put it down to go to work or bed or anything else. If you have the patience for the slow beginning build up, the payoff is totally worth it in the end. Sorry it took a bit to get into, but I'm glad that it was a worthwhile read in the end. Sometimes you do just have to keep going and see what you think! Yeah, and so often I don't feel like I have the time to wait to get into something. But it was worth it this time. Thanks for stopping by! I had a similar experience with this book. I had a hard time getting into it but once I did I really enjoyed it. I am glad that you enjoyed it in the end. Glad I wasn't the only one! It's nice to know it isn't just me, that the book was similar for others. Thanks for visiting! It definitely ended up that way. Thanks for stopping by! It's nice when a slow beginning has a good payoff!! Especially when it is a book you were really excited for in the first place. Thanks for visiting! It's definitely worth a try, and it helps to know you have to give it a bit to get going. Thanks for stopping by! I felt a little obligated to give it a longer try than normal because I had won it on Goodreads, and then didn't receive it, so emailed to check on it, and then they sent it. So, I felt like I had to give it a good chance. And I'm glad I did. But like you I usually don't give books that long, just too many others still to read! I tend to give up pretty quickly on audiobooks. If it doesn't keep my attention enough that I'm actually hearing what is happening, or I can't stand the voice of the narrator, I give up. Hope when you give this one a try it works better to start for you! Thanks for visiting!